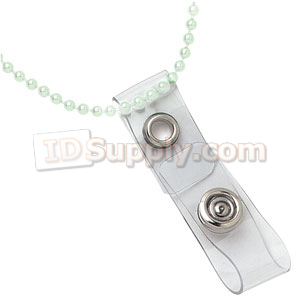 NCA Neck Chain Adapter are made with a clear vinyl strap and has a 3/8" diameter snap. The strap will pass through the slot made with our slot punch or the slot in our badge holders. Use the adaptor with a metal neck chain (shown) or plastic beaded neck chain.